To celebrate my blog-o-versary/ the first birthday of Polishology, I did a fun celebration manicure! I had a lot of different ideas for celebration manicures, but in the end I really like what I came up with! For this manicure, I started off with two coats of Zoya Areej, a gorgeous medium pink creme. I added white swirls using Konad Special White polish and plate m63. I then added one coat of Sally Hansen Xtreme Wear Cherry Punch, a really pretty reddish pink with silver holographic round and bar glitter. Finally, I added cupcakes using BM14 and Sally Hansen Insta-Dri Brisk Blue and Konad Special White. For the finishing touch, I added a cherry on top using red rhinestones! Fuzzy artificial light pic for holo glitter effect! OPI Planks A Lot is clearly the brightest of the bunch, and compared to the other two hardly looks "dusty" at all, but compared to a more bright purple it definitely is. 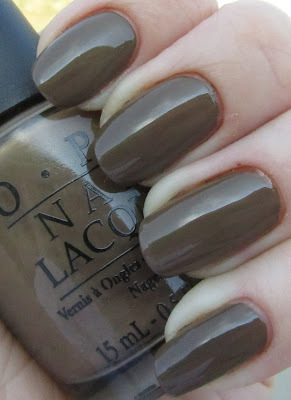 OPI Parlez-Vous OPI? is the darkest of the three, and definitely has the more muted dusty look as compared to Planks a Lot. Cult Nails My Kind of Cool Aid is the lightest, and also the most grayed out of all three purples (Grurple?). 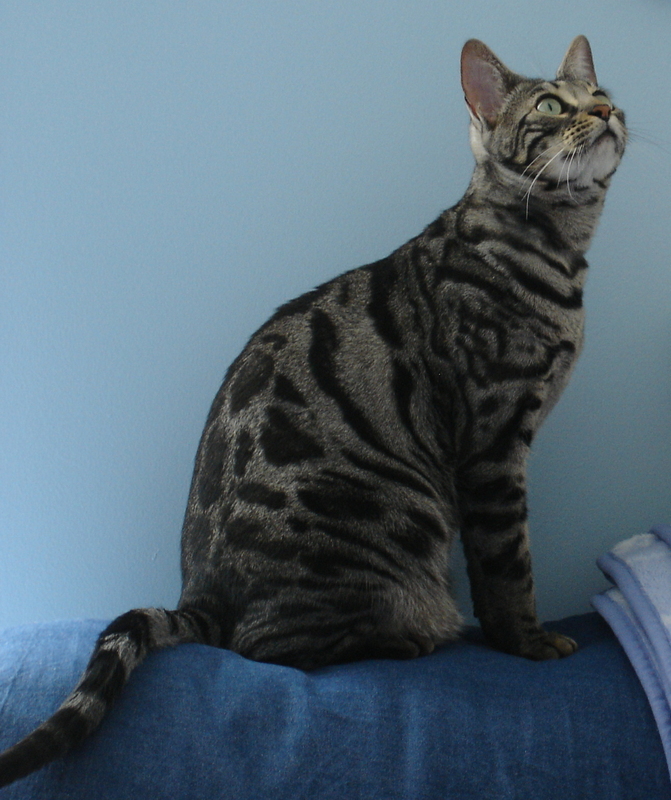 It is also the only of these three with a subtle shimmer; the others are cremes. 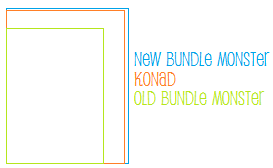 These differences are the same yet more pronounced in sunlight. 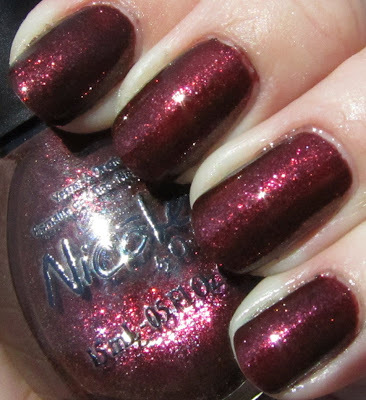 I used two coats for each here, and application was very nice and smooth on all three of these polishes. They are all very nice dusty purples, and each definitely has its own special place in my collection! On the last day of our vacation in Hawaii, we went to the Dole Pineapple Plantation to get some ice cream. As we were leaving through the shop, I spotted a rack of polish out of the corner of my eye, and of course had to reroute and check it out! It was a rack of Del Sol color changing polish, which is a brand I had heard about before and thought sounded like a lot of fun, so I picked one up to give it a go! This is Del Sol Girls Night Out, and the whole deal with this brand is that it changes color in the sunlight. Above, you can see the color this polish was indoors - a bright medium pink. However, in the sun, it changes into a deep dark berry! This polish also has a touch of golden microshimmer, which makes it even more gorgeous. I had no complaints with application or wear either. 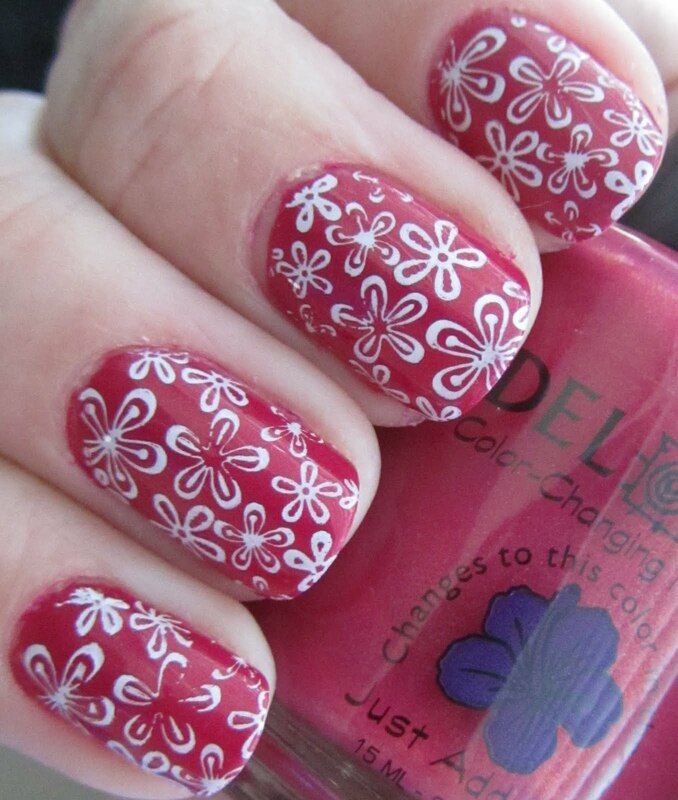 I stamped the flowers with BM-205 and Konad Special White. I did this mani the day after we got home - between this and my Hawaiian Pink Diamond manicure, it was a great way to bookend an awesome vacation! I recently went on an absolutely fabulous vacation to Hawaii, and of course I did up my nails for the event! While these nails only last a few days there (pool, snorkeling, sand castle building... it is all rough on manicures) they were a great start to the trip! For these nails, I started off with three coats of Sally Hansen Nail Prisms Pink Diamond, an amazing medium pink linear holographic. 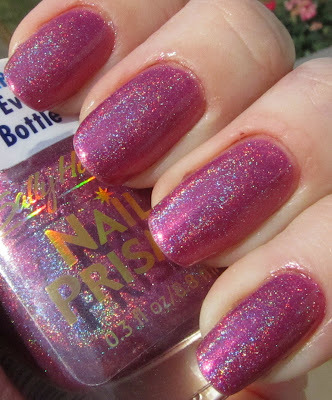 This is just such an amazing holo... I have a couple of pictures of it by itself later on. 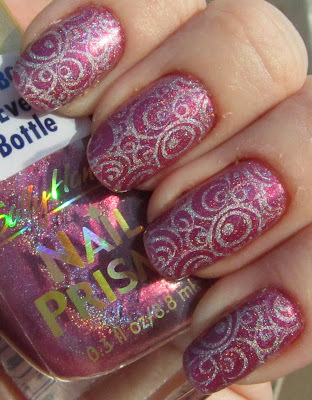 I then added swirls using the design from Konad plate m65 and Color Club Worth the Risque. Love this polish! 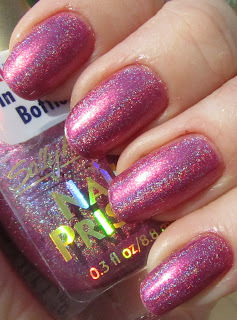 I only have one other SH Nail Prisms.. maybe it is time to make a visit to evilBay and get some more? Is this collection not just amazing? I can hardly wait... those glitters look spectacular and I am loving the berries as well. I might need just about everything from this collection... I hate to get too excited over promo pics but I really think I am going to love just about every single one of these. Which polish(es) are you most looking forward to from this collection? 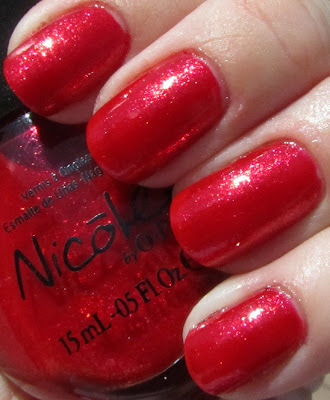 Today I have finally gotten around to swatching for you all the Fall 2011 additions to Nicole for OPI's Target Exclusive line, Something About Color. 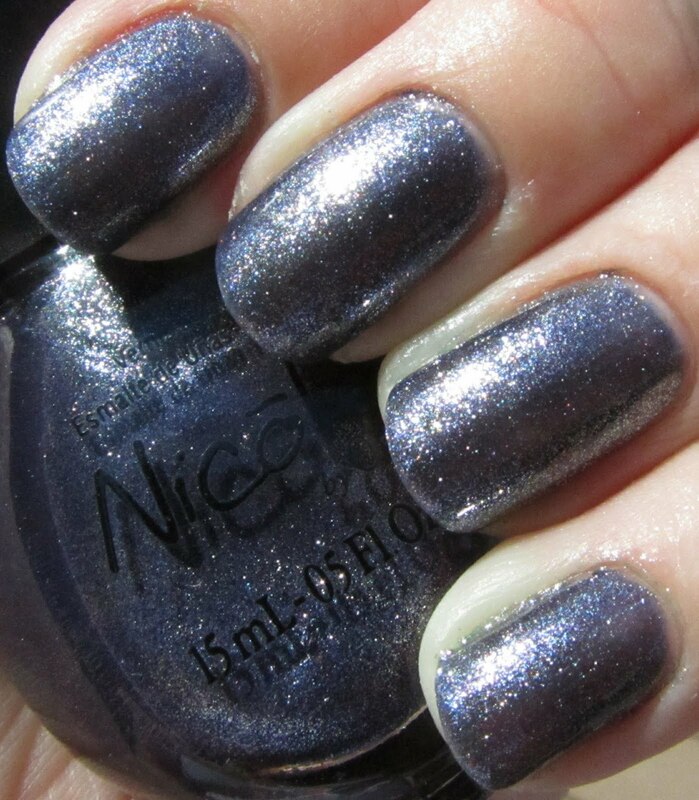 There are some seriously lovely sparkly shades in this little collection! Everything is shown with no base coat, with top coat. A muted medium green creme. This is a really pretty green, different than any of the other greens I currently have in my collection. This is three coats, but I could have totally gotten away with two if I hadn't kind of messed up my ring finger. Good application. 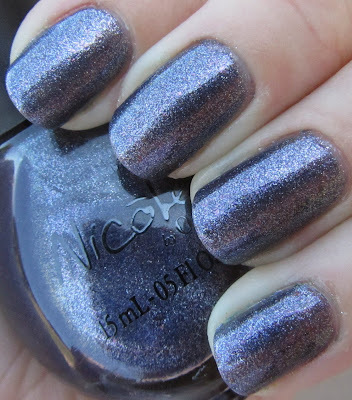 Totally gorgeous deep blue with a hint of purple, shimmery with a slightly foil finish. I love this one. It has such a gorgeous finish to it and the color is really fabulous. It is so sparkly in the sun and in the shade it just looks really awesome as well. This was three coats for full coverage. 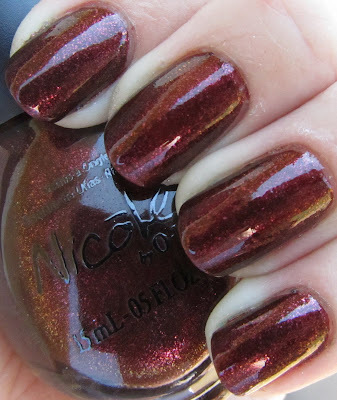 Gorgeous burgundy foily shimmer with a hint of golden duochrome. Also totally love this one - again, it is both beautiful in sun where is sparkles as well as in shade, where it smoulders. It has just a hint of golden flash around the edges that really puts this one over the top for me. This was two coats - also a plus! 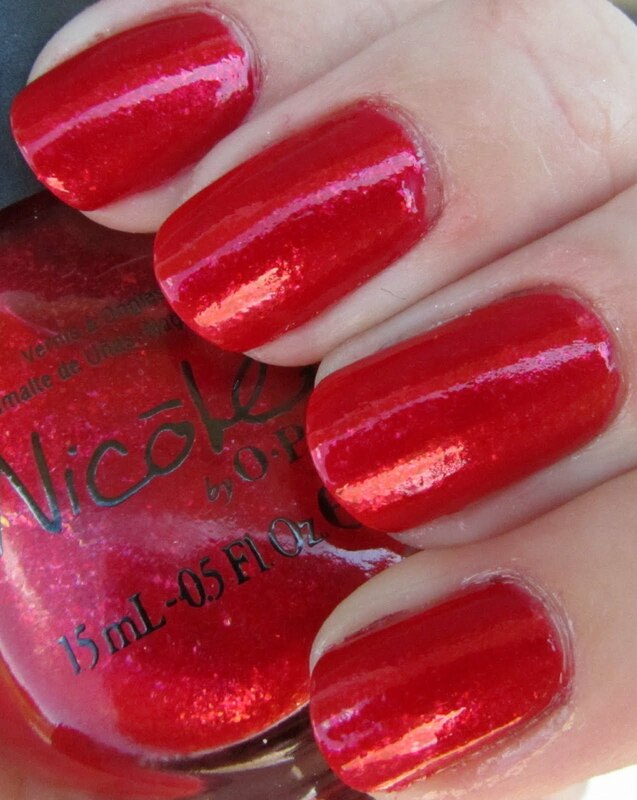 Bright cherry red with a gorgeous shimmery finish. Not normally my color, but for a bright red I do really like it. I had a tough time getting this one to photograph well so the pictures don't quite do it justice. Trust me, it's gorgeous! Three coats. I was really pleased with these polishes. I found them all to be pretty unique, at least in my personal collection - admitedly smaller than a lot of yours, I'm sure! My two favorite standouts here were It's Not Me, It's Blue and Sounds Grape to Me. All polishes applied wonderfully and were between 2-3 coats for full opacity, which is always nice! Definitely a wonderful little collection in my book. I wanted to share with you today one of my three treasured Nfu-Oh flakies. These polishes are absolutely stunning to wear, and impossible to do justice to on camera! Next time I wear this one I will definitely have to try for some better shots of it, since these are hardly fair. Anyway, on to the pretties! 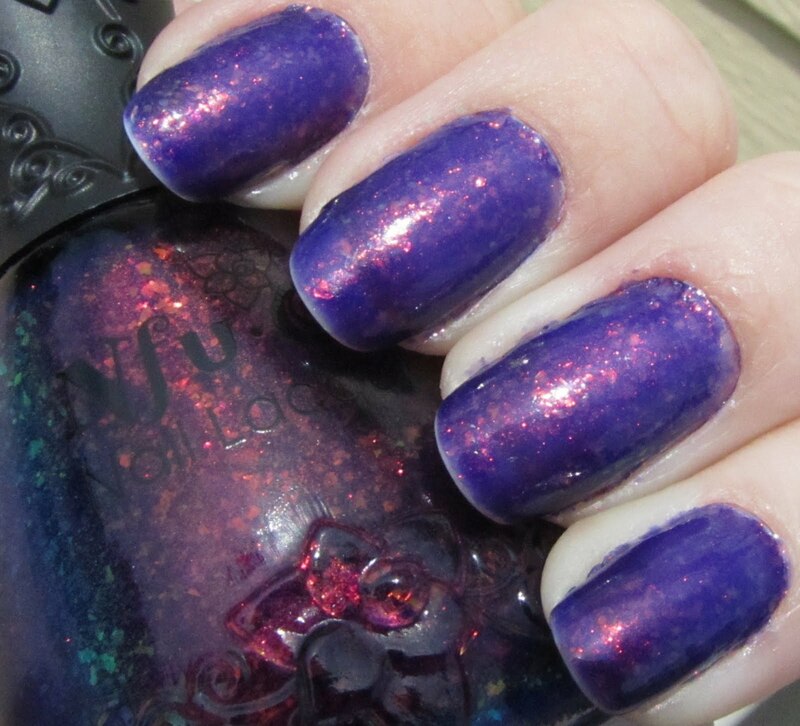 Nfu-Oh 51 is an amazing purple multi-chrome flakie bottle of pure awesome. This has so many different colors depending on the lighting that hits it - sometimes a deep purple with a blue shimmer, sometimes golden-green, others a very bright reddish purple... it is hard to describe the many faces of this polish! 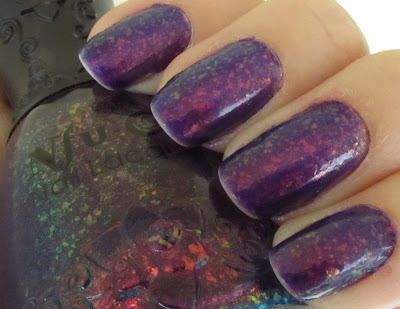 This was three coats on its own, I think it would also work very well for layering (I may have to try that next). Sorry for the tipwear, this manicure was a couple of days old when I finally had time to take some pictures! Another one of the many colors of this polish, in direct sunlight it takes on this rich purple color with what appears to be pink and gold shining through from the flakies. It looks totally different than in the first picture! Again sorry I could not do this baby justice here, you will just have to take my word on its incredible nature. I will most likely be wearing it again soon and will do my best to get some even better pictures! 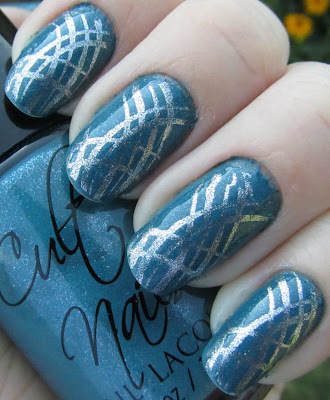 Another gorgeous polish from Cult Nails, Let Me Fly is a dusty teal blue loaded with silver and pink shimmer. Application was wonderful at two coats, great dry time and wear. Beautiful! Last October I did a manicure in honor of my sweet baby boy Leo. I decided it was about time that I did one to honor his slightly diabolical but still very loving sister, Luna! For these nails, I started with two coats of Zoya Dove as the light gray base. 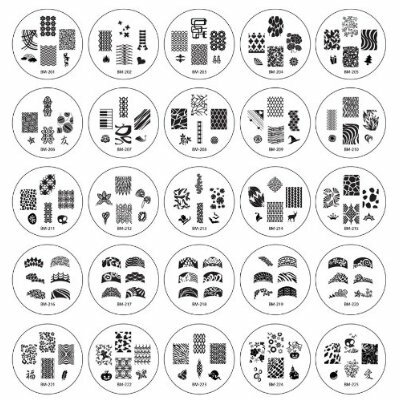 I followed this up with leopard print stamping from BM-221 for all but the ring finger, and the design from M57 for the ring finger, using Konad Special Black. 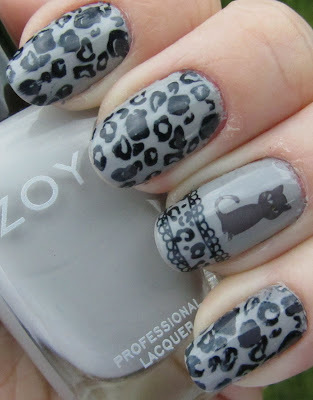 I then added darker gray dots to some of the leopard spots using Zoya Kelly, as well as adding the kitty image to the ring finger in Kelly as well, using BM04. I topped it off with a coat of Seche Vite and was good to go! I had a lot of fun with this one, especially with the accent finger. I don't often do accent fingers but it was really fun, I may have to do more in the future! 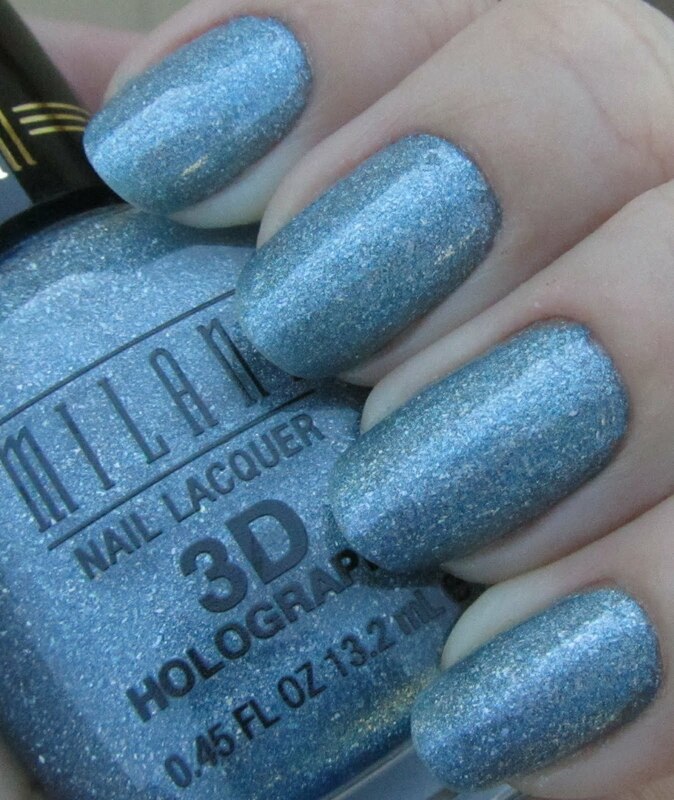 This is Milani Cyberspace, a gorgeous sky blue holographic polish, with scattered holo effect. 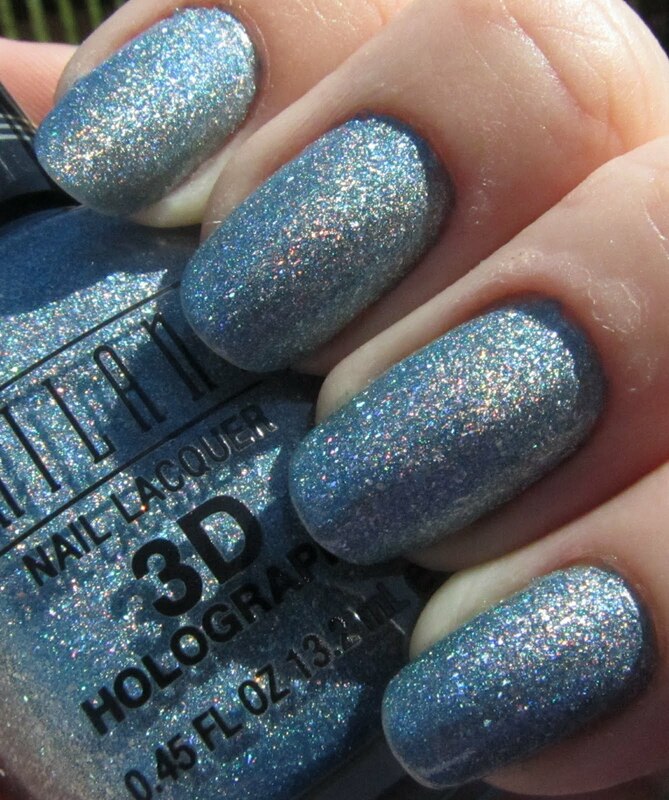 I love this one - light blue is one of my favorite colors, and of course holos are always fun. Application was great, three coats for full opacity with super fast dry time. While it does lose that holo glow in the shade, it still has a very nice glittery look to it - and it is still that fabulous light blue color! I got one more of these (the light green), but I may have to go back and get me a couple more. I was very pleased with this one!